Now let us take a look at some of these new features in more detail. The Manage Packages dialog now has an Include Prerelease check box which when checked will allow you to search for and install prerelease packages. 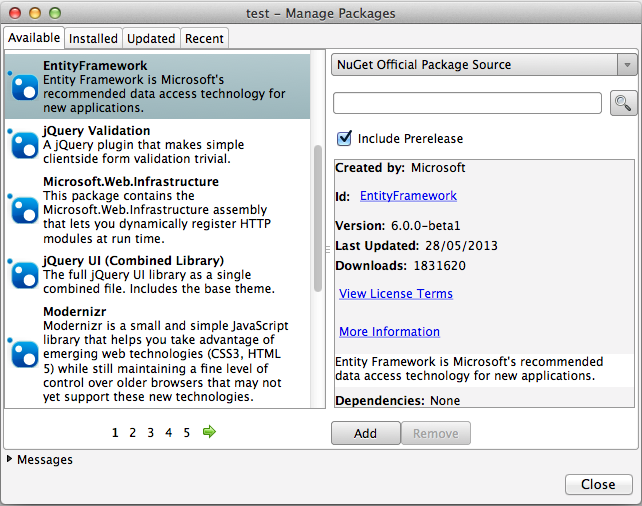 In the screenshot below the Entity Framework prerelease package has been selected. Further information on XDTs is available on the MSDN. When an error occurs on installing, updating or uninstalling a package the error message is now shown in the dialog instead of being hidden in the expandable messages section. 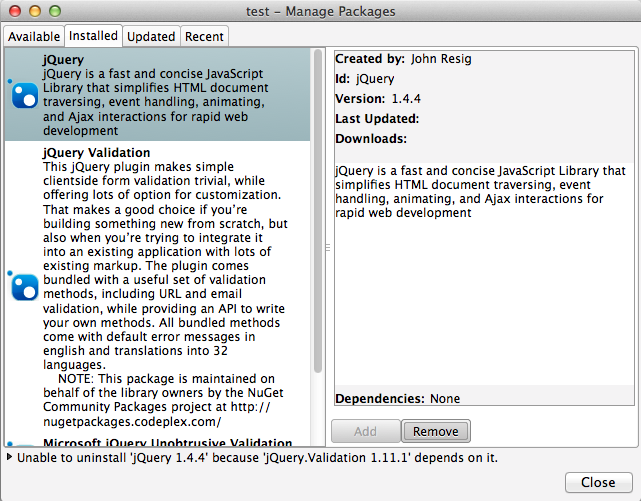 In the screenshot below an error is shown when trying to uninstall jquery when another package depends on it. You can now browse and install packages from authenticated NuGet feeds that use basic authentication and Windows authentication. Currently there is no login dialog but you can add your username and password to your NuGet.config file. To add your username and password to your NuGet.config file you will need to use NuGet.exe and run the following command, replacing the feed name, username and password with the correct values. Note that if you are using a version of Mono older than version 3.0.12 then you will need to use a custom build of NuGet.exe otherwise you will get an InvalidOperation error message “This XmlWriter does not accept Text at this state Prolog.” when running the above command. The custom build of NuGet.exe is available on GitHub as well as the source code. After adding your username and password to NuGet.config you will need to restart Xamarin Studio since the information held in the NuGet.config file is cached. NuGet 2.6 will now check for existing files in your project that match those being installed by a package. If there is a match then a dialog will be displayed so you can decide whether to overwrite the files. were not being removed and re-added when installing a NuGet package that included that reference. The addin is also available to download from a custom MonoDevelop repository.